Kepler 34b is an interesting planet in that it is circumbinary, meaning it orbits a binary star. It’s discovery was announced in Nature in 2012, along with another circumbinary planet known as Kepler 35b. When they were first discovered, such circumbinary planets were a bit of a mystery, because its been thought that the region around a binary star is hostile to planets. Orbits of Kepler 34b and other circumbinary planets. Credit: Welsh, et al. In the case of Kepler 34b, it orbits the binary at a distance of about 1 AU, or about the distance of the Earth from the Sun. The stars in the binary system are each about the mass of the Sun, and orbit each other at a distance of about 0.2 AU, or about half the distance of Mercury from the Sun. This means the planet lies in a kind of “zone of death” for forming planets. In a recently published paper in the Astrophysical Journal, researchers used computer simulations to show how the gravitational perturbations of the two stars would tend to give some protoplanetary masses a great deal of energy, which makes high speed collisions between protoplanets likely. Thus, the formation of planets in this region is unlikely. 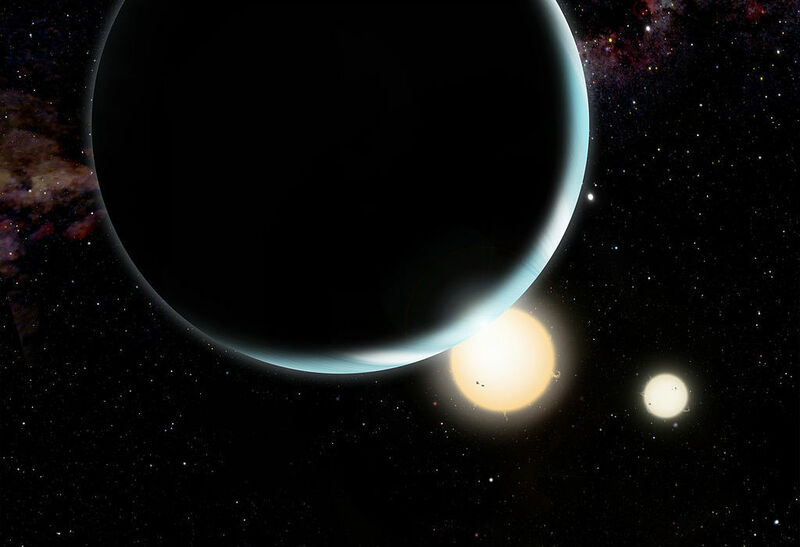 The authors also found that planets such as Kepler 34b could form farther away from the stars. Thus it is likely that such a planet would form farther out, where the gravitational perturbations are less strong, then later through gravitational interactions with other planets move inward to its present orbit. This means circumbinary planets are more common than originally expected. Based upon observations of planets and protoplanetary disks around close binary stars, it is estimated that perhaps 1% of close binaries have planets. That would mean millions of planets in our galaxy could have a Tatooine-like view. Paper: Welsh WF, Orosz JA, Carter JA, et al. Transiting circumbinary planets Kepler-34 b and Kepler-35 b. Nature. 2012;481(7382):475-9.